It is our mission to create meaningful reductions in non-sustainable resource utilization through the promotion of environmental awareness. Be the Solution. Start here. After lunch workshops examine wasted natural resources. Your cafeteria is the ideal classroom to foster awareness about Earth’s resources and promote healthy, waste-free alternatives! Engaging and gross, cafeteria sorts develop an understanding of personal consumption and inspire eco-friendly choices at school and home! All students are actively engaged in self-sorting their lunch remains to develop awareness about the importance of conserving precious, non-renewable resources. After lunch, students are invited back to examine results and access viable solutions such as portion control, reusable packaging, and recycling. 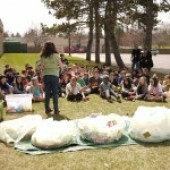 By evaluating the tremendous amount of waste generated each day, students realize how their environmentally responsible choices make a difference. All programs include post-Cafeteria Sort assessment, lunch sort, post-lunch workshop and post-sort activity sheets to help reinforce messaging. Base Cost: $450. Cost varies on # of lunch periods and post-sort workshop. Supplies for students to sort lunch remnants into specific categories: Food waste, recyclables, milk/juice containers, compostables (if applicable) and single-use materials and trash. Three 30-minute Resource Workshops. Ideal for 3rd, 4th and 5th grades. *Pre-lunch “Important R’s” assembly available for grades K-2 for an additional $200. Watch “Be the Solution” here! Support PLP. Become a Member.